The European Dividend Aristocrats are based (by S&P) on the 40 highest dividend-yielding Eurozone companies within the S&P Europe 350 index and a managed dividends policy of increasing or stable dividends for at least 10 consecutive years. The S&P Europe 350 index is a bit like the S&P 500 for the US. Please note that there is also an index create by S&P, named the Euro Dividend Aristocrats. This index is based on high yield stocks with a stable or increasing dividend of 10 years, see the Euro Dividend Aristocrats list. The European Dividend Aristocrats performance, 10 years annualized total return is 12.54%, compared to 9.95% for the benchmark index. The average P/E ratio is 15.58 and the indicated dividend yield is 3.19%. Overall a good performance and solid fundamentals. Below a chart of the historical performance since 2009. As explained the European Dividend Aristocrats Index currently contains 39 stocks . 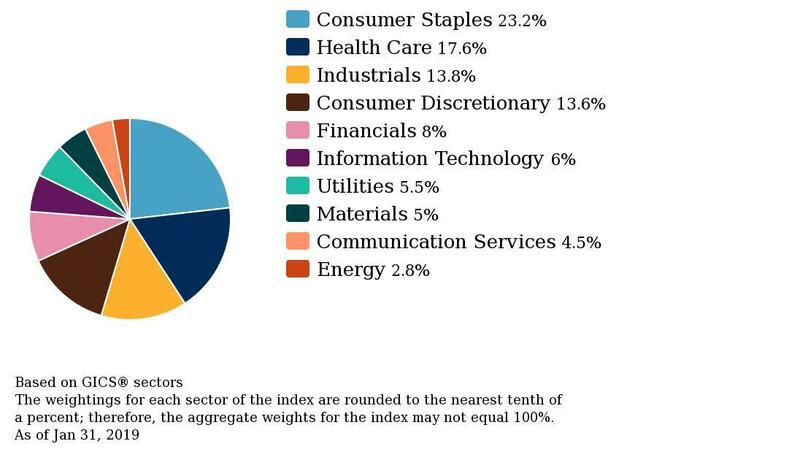 As you can see below, the Consumer Staples accounts for 23.2% of the index. Energy sector is on the other end of the spectrum at less than 1% of European Dividend Aristocrats Index. To compare, the largest US dividend aristocrats sector is also Consumer Staples.